"I know what I want. The black man." Three very big names took part in this 1982 comedy: director Richard Donner (The Omen, Superman, Get Smart), Jackie Gleason and Richard Pryor. On the surface, a feature that merges two comic giants from vastly different eras, directed by an equally prolific television comedy veteran, would have the makings for real entertainment. We all know about the best laid plans of mice and men, and unfortunately The Toy seems to fall short of it's intended mark. 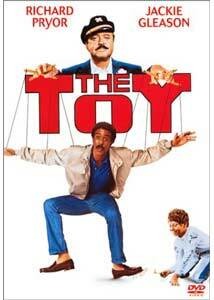 At it's most base level, this is a Richard Pryor vehicle, and were it not for him all would be lost. Jack Brown (Pryor) is an out-of-work journalist who is so far behind on his mortgage payments he is about to lose his house. Desperate for a job, Brown finds work as a part-time cleaning lady for the filthy rich newspaper mogul U.S. Bates (Gleason). This easy sight gag finds Brown in a tiny French maid outfit, haphazardly serving fried chicken during one of Bates' large business lunches. After causing the expected mayhem, Brown is somehow sent to work in one of the Bates-owned department stores where he is chosen as a 'toy' by Bates' spoiled 10-year-old son Eric (Scott Schwartz). The rest of the film unfolds predictably as a warm, fuzzy comedy that focuses on Jack's attempt to teach Eric that friends can't be bought, and that they have to be worked for. There is no mistaking Pryor's brilliant comic ability, and even though the overall story leans toward 'safe' territory, there are still enough opportunities here for him to generate a fair amount of laughs. Pryor, who by 1982 was already years past his standout roles in Silver Streak and Stir Crazy, to say nothing of 1979s' caustic Richard Pryor: Live in Concert film, falls prey to what invariably happens to all sharp-tongued comics as they become muted drastically by Hollywood to the point of near castration. The good news is that Pryor's very presence, even toned down, still manages to save this film from collapsing on itself into an overly maudlin and sappy comedy. Great talents like Jackie Gleason and Ned Beatty are completely wasted, and are relegated to one-dimensional cartoon characters, with really no purpose other than attempting to divert some of the focus off of Pryor. The film really grinds to a halt when Pryor is not present, and I find it hard to imagine that Donner could not put Gleason and Beatty to better use here. The intriguing marquee value of teaming Gleason and Pryor together is never fully developed, and that is one of The Toy's major problems. How can Gleason, a man who personified television comedy at one point, be paraded out as a broadly painted caricature? The Great One's talents are not utilized to full extent, and that affects the film's overall balance. The supporting cast, which includes the always perfect Wilfred Hyde-White as faithful manservant Barkley and Teresa Ganzel as the top-heavy, ditzy wife of Gleason, fill out the background much better than Beatty. Karen Leslie-Lyttle's sexually frustrated Fraulein is corny and over-the-top, and seems even more so when matched against Hyde-White's refined Brit. Donner, who has proven himself to be a director of such mass appeal franchises like Lethal Weapon, contributes a paint-by-numbers product, relying soley on Pryor's comic timing to carry the film. An excellent cast is misused severely, and without Pryor, the whole film would have become a hokey mess. Image Transfer Review: Columbia TriStar has issued this disc with both a widescreen 1.85:1 anamorphic transfer and a 1.33:1 full-frame version, available on the flipside. There were very few blemishes on this print, with only a few significant marks during the film's final moments. Colors have a nice, warm hue, with fairly consistent and natural flesh tones. Interior daylight scenes look bright, but some of the outdoor sequences show their age slightly with sporadic fluctuations in the intensity of the color field. The night scenes, especially during Jack and Eric's stealth recon mission into the office of U.S. Bates, fall victim to some minor black level issues that don't provide too much in the way of shadow depth. The image transfer here is nothing special, but considering it's age, The Toy doesn't look too bad. Audio Transfer Review: The film's original mono track, presented here in both English and French, is noticeably lackluster. Aside from the natural limitations of mono, the track is overly muddy and flat. This really dates the film, and was somewhat of a distraction. I don't know if The Toy merits a costly remastered 5.1 mix, but this is certainly an example of how a listless audio track can hamper a film's DVD release. With the growing number of DVD viewers adding sophisticated home theater sound systems, a rerelease like this only serves to highlight it's limitations. Hiss is evident at times, and only adds to a generally weak overall audio track. Extras Review: There isn't much here in the way of extras. The three pan-and-scan trailers (Matilda, Jumanji, Hook) are about all there is. The Matilda trailer is interesting only for it's use of the often borrowed theme from The Nightmare Before Christmas. An abundance of subtitle options (English, French, Spanish, Portuguese, Chinese, Korean and Thai), along with a whopping 28 chapter stops, are the only other disc features. I know many people hold a warm spot in their hearts for The Toy. I guess I'm not one of those people. The overly simplistic story is little too syrupy at times, and turns a great comedic talent like Richard Pryor into a watered-down version of himself, while a legend like Jackie Gleason dishes out a broad rich guy caricature that could have been filled by any character actor. This is a fairly family-friendly title, which seems to be a rarity these days. That's a good thing. Pryor provides some good chuckles, but as a whole The Toy has not aged well.